Brookings India hosted a discussion on the prospects for United Nations (UN) Security Council reform featuring Dr. Jacobus (Jakkie) Cilliers, Executive Director, Institute for Security Studies, Pretoria; Dr. Sreeram Chaulia, Professor and Dean, Jindal School of International Affairs; and Professor C.S.R. Murthy, Centre for International Politics, Organization and Disarmament at Jawaharlal Nehru University on 6 August 2015. W.P.S. Sidhu, Senior Fellow for Foreign Policy at Brookings India moderated the discussion. The issue of United Nations Security Council (UNSC) reform has been a high priority one for India and other aspirant countries, notably Brazil and South Africa. Although the issue has been on the agenda of the UN General Assembly (UNGA) for several decades, there is very little sign of any forward movement. UNGA’s inertia on the issue, coupled with severe deadlock among countries, regarding the possible path to UNSC reform has brought into question the timing for reform. With the rising scale and magnitude of crises around the world, increasing atrophy in the UN-led international order, and reducing margin for error in the post-Cold war world, many contend that the time is ripe for UNSC reform. Others called for patience and the need for small, incremental steps that can produce a gradual change in the mindsets of the five permanent members of the UNSC (P5) towards reform. Still others maintained that there will never be a perfect moment for reform – the world can either wait for a global crisis to erupt (like the Second World War, which led to the creation of the UN) and then more forward with reform or take immediate steps now. The slow movement on the issue has made it increasingly clear that the Council’s reform will require a change in approach– shifting the paradigm away from power politics to one based on principle and people power. One such approach has been proposed by the ‘Elect the Council’ campaign, launched by the Institute of Security Studies, Pretoria. This campaign proposes regional elections to the UNSC, based on a minimum membership criteria managed by regions, and permitting a 15-year transition period for a reformed UNSC. For this to work, 128 members of the UN would have to unite around a set of detailed proposals which capture the ‘sweet spot’ between power politics, legitimacy and effectiveness. In this process, pressure from the global civil society can play a tremendous role. The region-focused approach to UNSC reform needs to be linked with civil society activism to change the deliberation on reform from being an elite and statist exercise to an open and transparent one. Elect the Council proposes regionally-managed minimum criteria for membership to the UNSC based on experience and capacity; good financial standing with the UN and its agencies; willingness to shoulder additional financial contributions to UN efforts as determined by UNGA; and respect for open, inclusive and accountable governance, rule of law and international human rights standards. The UNSC would also draft rules of procedure, including rules for dealing with key inter-state conflicts. However, some view the criteria as being too simplistic– countries have varying positions on several issues including human rights and governance. Thus, adherence to a set of values as a pre-condition to UNSC membership will lead to exclusion of key states in the system. Similarly, the intent to do away with the veto is simplistic, as political weightage of members, such as the United States, cannot be captured through the quantitative framework proposed by Elect the Council. Moreover, the region-centered framework faces two important challenges. First, reliance on regional representation leaves out an increasingly important cultural dimension: It is unclear how Arab countries and other communities, that are not part of the regional electoral groups, would be represented within the framework. Elect the Council’s proposal therefore runs the risk of antagonizing regionally-unrepresented, culturally-significant communities. Second, the dichotomy between regional and global problems oversimplifies ground realities where conflicts spill across borders and regions. Finally, international institutions such as the UN have their own life cycles and cultures of mortality and immortality. The UNSC, which is popularly termed as the ‘nerve center’ of international politics is increasingly losing its legitimacy, both in terms of structure and function. To achieve the structural and operational transformation of the UNSC, global civil society will have to exert pressure on UNGA members, especially the P5. A change in approach that departs from purely protean power politics and includes principles and civil society engagement is likely to be a determining factor in reforming the UNSC. Countries will have to find a middle ground and come to an agreement that balances effectiveness, legitimacy and power politics of the world’s most exclusive club. Ms. Kriti Sapra contributed to this report. 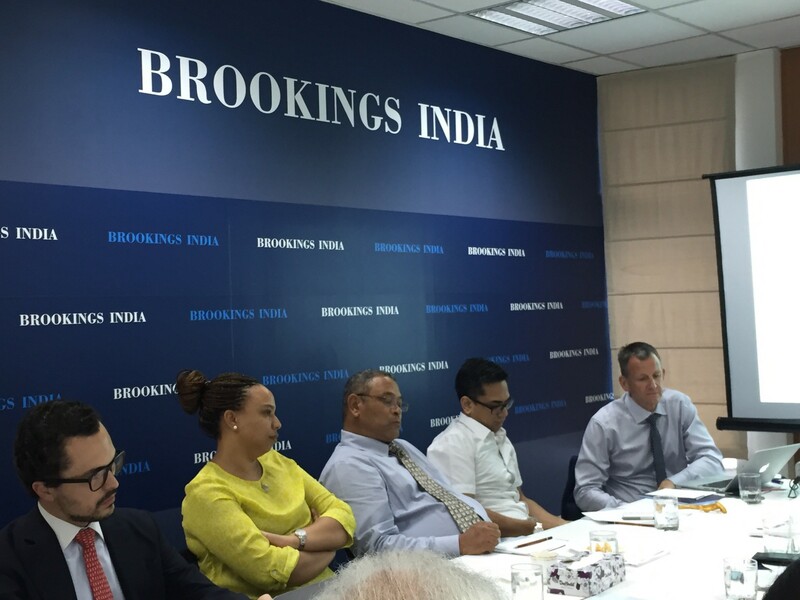 Brookings India hosted a discussion on the United Nations Security Council reform featuring Dr. Jacobus (Jakkie) Cilliers, Executive Director, Institute for Security Studies, Pretoria; Dr. Sreeram Chaulia, Professor and Dean, Jindal School of International Affairs; and Professor C.S.R. Murthy, Centre for International Politics, Organization and Disarmament at Jawaharlal Nehru University. The discussion was be moderated by WPS Sidhu. The issue of reform of the United Nations (UN) Security Council is high on the priority of India and other aspirant countries, notably Brazil and South Africa. Although the issue has been on the agenda of the UN General Assembly for several decades there is very little sign of any forward movement. Earlier this year the Institute for Security Council, Pretoria launched a consultation process that intends to set the scene for a global campaign on Security Council reform called “Elect the Council”. The campaign seeks to build a global partnership of civil society organizations and intends to shift the paradigm away from the power politics to one based on principle. What are the prospects of a civil society movement successfully challenging the protean power politics that have prevented reform of the Council? How will this campaign work in practical terms, especially in countries where civil society is weak or non-existent? Are there other possible approaches to reform the Council? Our distinguished panel will address these questions.